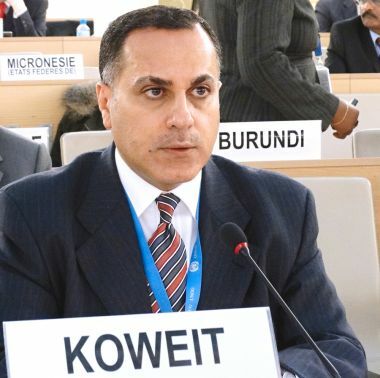 GENEVA-- Kuwait's Permanent Delegate to the UN and International Organizations in Geneva Ambassador Jamal Al-Ghunaim affirmed Friday Kuwait's keenness to continue humanitarian and political support for Yemen. Ambassador Al-Ghunaim's speech came at a meeting organized by the UN Office for the Coordination of Humanitarian Affairs (OCHA) in Geneva to review the efforts of various countries in dealing with the humanitarian crisis in Yemen. Ambassador Al-Ghunaim stressed that Kuwait has been supporting humanitarian, relief and development efforts in Yemen, revealing that the recent visit by UN Special Envoy for Yemen Martian Griffiths to Kuwait and his meeting with His Highness the Amir Sheikh Sabah Al-Ahmad Al-Jaber Al-Sabah had reflected his country's commitment to the cause. The last of these efforts occurred in the previous month with a number of international humanitarian organizations and funds including the World Health Organization (WHO), United Nations Children's Fund's (UNICEF) and the International Organization for Migration (IOM), said Al-Ghunaim. He added that this cooperation also included the United Nations Food and Agriculture Organization (FAO) and the Humanitarian Support Fund for Yemen and the United Nations Population Fund (UNFPA). In his speech, Ambassador Al-Ghunaim pointed out that Kuwait's role and contributions to these international organizations and funds have garnered global praise and administration. The Kuwaiti Ambassador said that his country will continue to work with partners around the world so that a peaceful solution would be attained for the Yemeni people, bringing an end for their suffering and misery.